My VCFA compatriot, Adi Rule, made this gorgeous meme. I'm looking forward to her YA debut, Strange Sweet Song. Aside from the picture of me reading from Don't Touch at the bottom of the post, this was originally posted on Quirk & Quill. 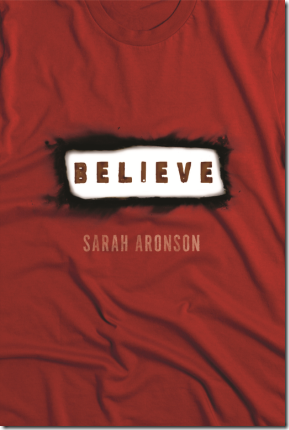 Last weekend, I had the pleasure of attending--and reading at--Sarah Aronson's book launch for Believe. I haven't read my copy yet, but Believe promises to be an intriguing exploration of the unwanted celebrity our culture thrusts on the survivors of public tragedy. It's been named an ALAN Pick, and if the book is anything like the book LAUNCH, it's going to be amazing. Planning a book launch is a daunting task, but Sarah designed this event in a unique way that made it successful on multiple levels. First, the event took place at Curt's Cafe, a mission-based non-profit that trains at-risk youth in food-service and life skills. All the food for the book launch was donated, so attendees were encouraged to donate and to buy raffle tickets to support Curt's Cafe. Allowing the event to double as a fundraiser may have encouraged more people to come. And Sarah says, "The spirit of the event IS the spirit of Curt's! I hoped we could pack the house (we did!) and help them continue to make a difference in our community." Everybody wins. Second, Sarah invited a number of local authors to participate in a group reading including Penny Blubaugh, Carol Brendler,Ilene Cooper, Brenda A. Ferber, Ken Krimstein, Jenny Meyerhoff, Ellen Reagan, Laura Ruby, Natalie Wainwright, myself, and of course, Sarah! Sarah wanted "to honor the process of writing," to share that with her friends, and to "honor the VC and MFA experience." 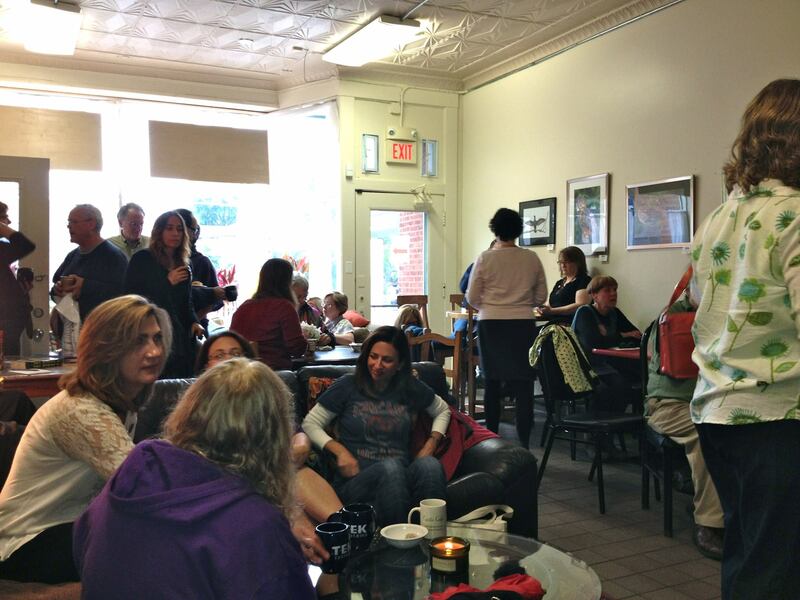 Many of the readers attended VCFA; Laura Ruby teaches in a similar program at Hamline. The event definitely took me back to the readings at Vermont College of Fine Arts, where students and faculty often read from works in progress. It was so exciting to hear snippets of books that are in various stages of the submission and publication process. And for Sarah, the callback to VCFA had extra meaning since the first version of Believe was her graduate reading. This group reading also cultivated a great sense of community. I've long admired some of these authors but never before met them in person. Now, I've not only met them, I've heard what they're working on. And it was great to see VCFA alums like Carolyn Crimi and Linda Washington in the audience. As Sarah says, "For me, writing is all community. 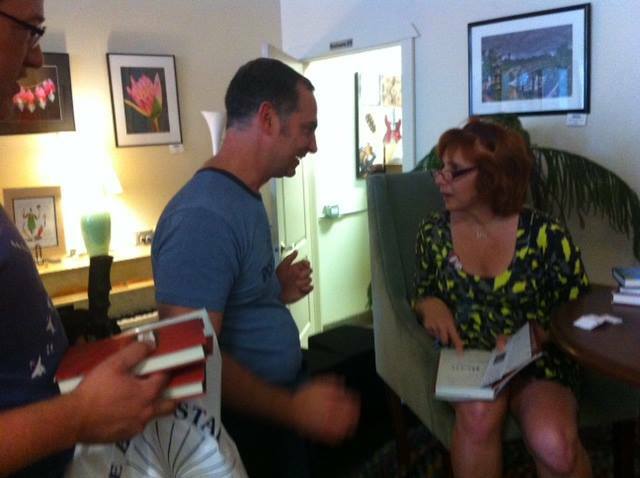 Over the years, the readings I've participated in have made me feel like a writer, have helped me make amazing friends. What better way to celebrate?"